This entry was posted on Friday, September 30th, 2011 at 05:15 and is filed under Economics, Election 2012, Law, News, Politics, Tea Party. 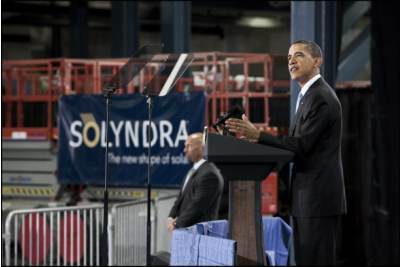 The crony-capitalism running rampant in the “green energy” initiatives of the Obama administration continue to escalate. Today, it’s being reported in several media outlets that another three-quarter billion dollars in loans are being guaranteed by the federal government. Worse, some of the same people are involved including Steve Mitchell who was on the board of directors of Solyndra. He also serves as a “board participant” for Solar Reserve, the parent company of Tonopah Solar. The US Department of Energy provided another $737 million in guarantees to Tonopah Solar for a new project in Nevada. As it turns out, Nancy Pelosi’s fingerprints are all over this too. That elections should be suspended to permit them to rule without consequence. That our money is theirs to expropriate, steal, reward friends and relatives, and use as they see fit. These politicians have always claimed that what they do, they do only for our best interests. We should have begun to recognize that they hold our interests as irrelevant to their plans, and that any claims they make to the contrary are simple camouflage for the theft in which they’re engaged. Who among us views the extravagant vacations of the whole Obama family as anything other than looting done under the cover of their position? Let’s not pretend that they have any intention apart from a malevolent desire to cash in at our expense. One of the most frightening aspects of what these incidents of crony capitalism and insider trading reveal are that this has all become quite routine in Washington DC. Our elected federal leaders have no problem squeezing us dry, and ultimately discarding us when we’re used-up. This can be the only real meaning of the voluminous bills that move from the House to the Senate and finally to the President’s desk for signature: They are using every opportunity to steal from us. Even if we imagine that we need some form of healthcare reform, even a grandiose vision like Obamacare, a notion I discard, is it truly necessary to engineer a piece of legislation that is thousands of pages long if it is only honest governance? No. As has been demonstrated since its passage, since we weren’t permitted to see it beforehand, the law is laden with all sorts of set-asides, boondoggles, and instances of crony capitalism for which we will pay with our wallets and our lives. Other pieces of legislation match this same description. It cannot be that it takes thousands of pages to craft such laws, and yet the laws and the continuing resolutions and stimulus plans are packed with page after page of hand-outs to this company and that group and these individuals and the other state or locality. As I’ve explained at length before, even the borrowing constitutes a theft as our currency declines in value in response to the wholesale printing. Most rational Americans are frustrated to the point of exhaustion. We must have reform, and it can only come at the ballot box, but this can only happen with the staunch and unflinching devotion of an American people moved to a house-cleaning frenzy. We must rid ourselves of the old and intractable Senators who wield our dollars like a club over our heads. We must remove this President who sees no problem with spending money on frivolous things while the country languishes in economic hardship to which he is a primary component. Perhaps more importantly, however, we must confront another part of the government that few of us ever notice, because we focus on the elected officials. In Congress, there is an army of staffers who use the laws that they author on behalf of their bosses in part to enrich themselves, generally with a wink and a nod from the elected members. These people constitute the palace guard and the fox in the hen-house simultaneously. They peddle influence and they use knowledge of the dark reaches of bills on page 2,214, Section 23x, where you will find the most outlandish things. Just like the officials for whom they allegedly work, they’re a mixed lot. Some are very decent and conscientious, but you could in no way consider that to be a majority of them. The White House is full of similar people, and indeed the entire executive branch is overwhelmed with them, and the executive levels of the various departments and agencies are stuffed full of people who are there because they knew somebody or contributed something to somebody important. This is the ugly back-side of Washington DC most never see, but it is there and quite prosperous nevertheless. Did you wonder why it is that only Washington DC’s housing prices seem to continue upwards while the housing market at large has been in free-fall? It’s much easier to afford nicer housing in better neighborhoods when the tax-payer is footing the bill. In 2012, voters will face an awful set of choices. If the country is going to survive, this gravy train must be derailed. The DC insiders love to lament how the spending is unsustainable while they vote to continue it, but the truth is that as long as we leave them in place, it will be the American people who will bear the worst of this growing catastrophe. It’s no longer enough to simply change teams. We must change the character of at least one of those teams, and we must clean up the supporting cast of characters too. This will not be accomplished all in one wave, but we can make a great first installment next year. For a change, we will all need to leave our comfort zones. This must be a sharp reversal. Time is nearly up. Unfortunatly with a democrat controlled Senate, no impeachment proceedings would have any traction there. Career politicians have to go! No more compromise. We are in an all or nothing point in American history. We have to turn back the clock on progressivism or lose our Freedom forever.